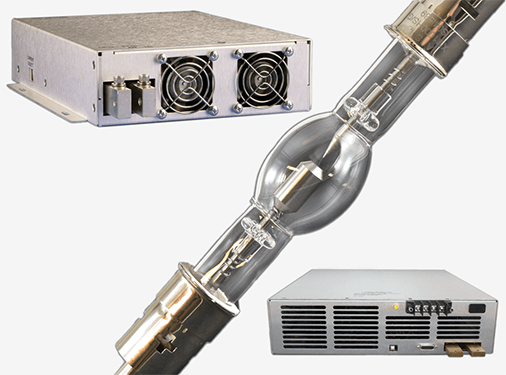 With arc lamp power supply models from 150W to over 7kW we have arc lamp power supplies for lamps offered by all major manufacturers worldwide. All models feature active power factor correction (single phase models) or universal 3 phase mains at 5kW and up. Compact switch mode design reduces size and improves the ripple spec to less than 0.5% on all models. The XLB series lamp ballasts are offered in 7 sizes from 150 to 6000 watts and are constant current sources designed for precision operation of short-arc Xenon lamps. The MLB series Mercury lamp ballasts are offered in 5 sizes from 650 to 7000 watts.